I come around the corner with a minute or two to spare. Shawn Lywood front and centre with that open mouth smirk of a smile he has hidden in a thick but manicured beard. A familiar Mile2Marathon hat shading his relaxed and welcoming eyes. 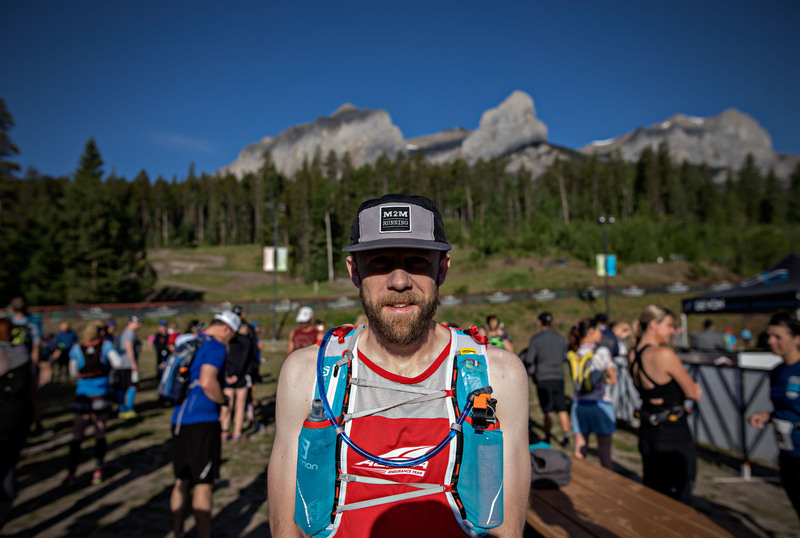 At 8:57 a.m., the day before the Rundle’s Revenge 50K race in Canmore, Shawn is leading a group of about fifteen runners on an easy run as part of Lululemon’s Test Truck activation. Shawn’s shakeout run, I suppose. After sauntering through the river valley to Ezio Faraone Park with the group, updating the Tweetsauce, and loading the car with Trevor MacLean — it’s road trip time. Okay, maybe we have a beer, some Moonshine donuts, and admire Trevor’s expansive Ciele hat collection while waiting for Shaun and Trevor’s partners to return from a barre class before hitting the open road. 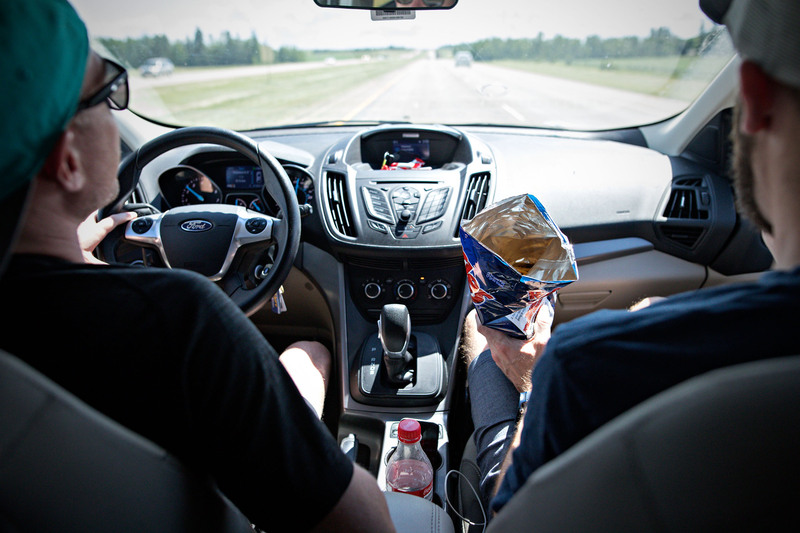 Race weekends typically involve two lane blacktop at some point and this weekend is no different with a four hour drive from Edmonton to Canmore ahead of us. Oh, and potato chips. Lots of potato chips. 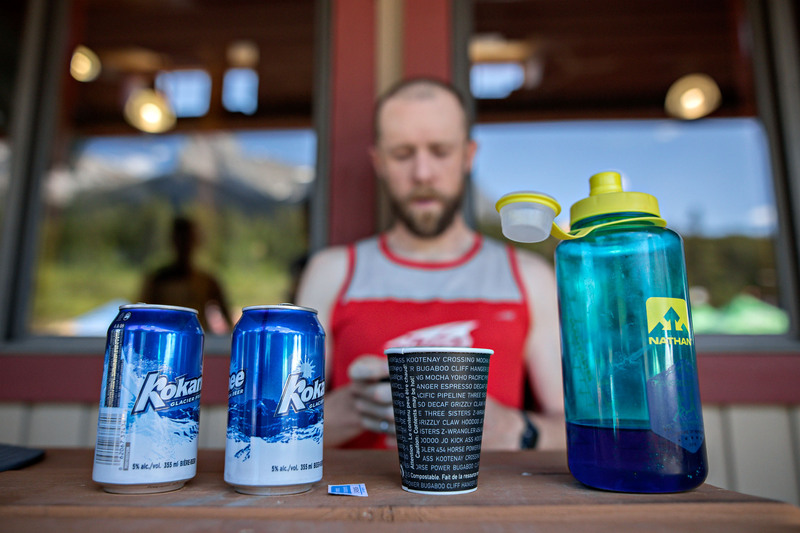 Upon arriving in Canmore, an invite from Rundle’s Revenge race director Kevin “Houda” McDonald comes in, and we grab some essentials, then head to Houda’s place for burgers and beers. My observations tell me that the actual race tomorrow feels tertiary for Shawn; his primary goal for the weekend is to have fun with others. Like leading the Lululemon run earlier in the day, the night before the race is all about spending time with good people. It’s comforting watching Shawn sit on the deck in this beautiful mountain town, and smile almost endlessly. We are surrounded by the crew of dirtbag runners sharing stories of races past, enjoying the last of the warm sunshine amongst the cotton ball fluff filling the evening air. It’s almost magical at times. Shawn’s clearly in his happy place. It’s never been more obvious to me that running for Shawn is truly about more than miles. From his first conscious breath in the morning, Shawn Lywood’s routine is meticulous. I get a glimpse of it yesterday after checking into the hotel when Shawn lays out his race setup on the desk by the window: all set for the next day. Dividends of the effort yesterday paying off this morning as Shawn enjoys his coffee without so much as a hint of concern showing in his face or body language. A clear hot day is in the forecast — confirmed by a glance out the window — as a precise race-prep unfolds in front of me in the dimly sunlit hotel room. Shawn being quiet and precise in his movements lets the others sleep as long as they can. Oatmeal is made in a hotel-supplied paper cup with hot water from the coffee maker and consumed with utensils picked up at Save-On yesterday. Race bag checked and double checked. I see the boxes getting crossed off in Shawn’s head. The morning is progressing as it should. This is not his first rodeo. When it’s time to head to the Canmore Nordic Centre to let Trevor to register for the race, Shawn ties his well-worn @Altra Superiors v2.0 and does one last test fit of his @Salomon S-lab Adv Skin 12 Set. 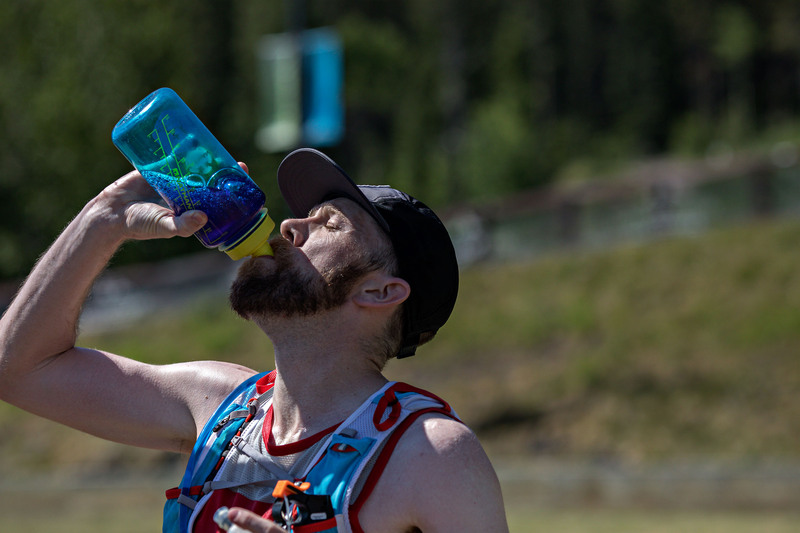 Shaun loads his run-vest with 1.5L of @goultima in the rear bladder, 500ml of water along with bear spray in the front pockets, and 7 @guenergylabs Ultra Endurance gels in lemonade flavour. Should I wear a T-shirt? The vest might rub here with a singlet. That’s the only hint of uncertainty in Shawn’s morning. We drive to the Nordic Centre as the cool morning air temperature starts to climb, just like Shawn will on the 50 kilometres of trails ahead. 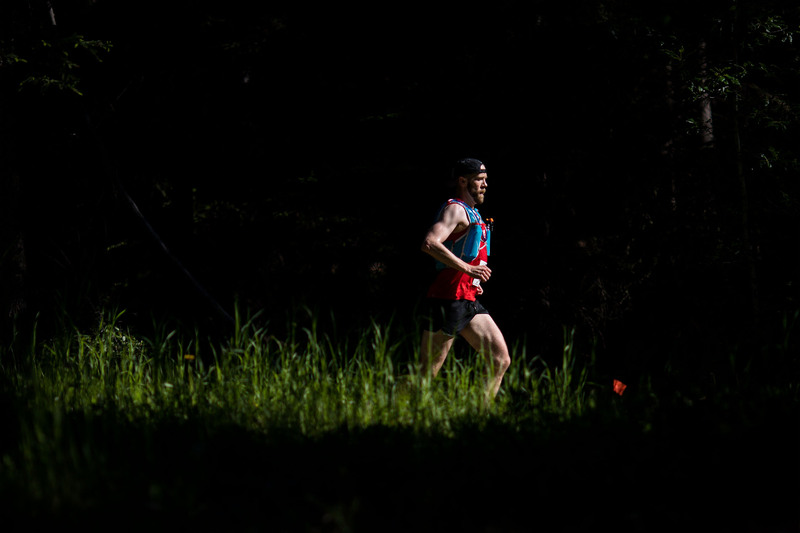 He ends up going with the Altra Endurance Team Race singlet. The T-shirt version — like milk on a hot day — would have been a baaaaad choice. Shawn and Trevor are rocking matching @Mile2Marathon hats today. The bromance is real, but once the @transrockiesevents Mountain Mule Trail Run starts, they are both all business. Trevor is out front ripping a white hot 25km finishing 4th overall at 2:08:02, and Shawn is pacing himself for the 50km. Shawn went out fast last year and paid for it dearly. That isn’t the case this year. A 1:14:44.9 first, and 1:13:27.7 second lap are bang on his goal paces. I spend the first lap with the pack getting some photos of other friends running, but for the rest of the race I track Shawn up, down, and through the course amassing a 16km run day myself. Shawn is calm and confident the entire race. Near the end of lap two, as I lie on the ground at the apex of a bend in the single track deep into the course with the wide angle pointed to the tree tops, I notice Shawn has passed a lot of runners and I comment on how he’s really mowing people down now when he rips by. Shawn replies with a bassy and stoic “oh yeah.” He’s on it. Shawn’s finish-line photo has more emotion in it than I have seen all weekend from this even-keel runner. A happy Shawn — finishing 4th overall/2nd open men — soaks in the post-race atmosphere on the deck next to the finish line cheering people on as they come in. He’s chatting with congratulatory friends, other runners, and enjoying his own buffet of recovery beverages. A well-executed race plan, an amazing time with friends, and a beautiful hot sunny day “out there” culminate in the perfect race weekend in Canmore.